well i finally did it. i bought those yellow shoes i've been eyeballing for over three months. A. they are yellow...i'm so a black, brown, sometimes red kind of shoe girl. but recently i bought my first pair of turquoise wedge shoes and well...i.love.them. i hardly ever EVER wear flats. i'm 5 foot 1 and well i think my legs look better in heels. sooooooo i ALWAYS wear some kind of heel. even my flip flops have a wedge on em. yup hang up 556 right there with hair issues and the color purple. or people that walk around with their arms over each other, or couples walking with their hands in each other's back pockets. i dunno why...just bugs. i bought the shoes they were a steal. and well because i'm obsessed with gray and yellow. together. mmmmm it just speaks FALL to me. so in true vanessa form i've been obsessively looking for the perfect gray dress to go with my yellow shoes. i want to wear it for our family pictures. because we've not had them done in more than two years. sad. link to this dress mmm, yes lovely but i'm short i don't know if it will go well especially with my flat shoes. i love the neck on this dress...but if i need to wear a cardi with it...bleh? LOVE this dress, neckline needs to be a little higher for me but i absolutely adore the full skirt. i am soooo loving the 1950's feel to it as well. and then theres this dress...that i think i'm basically coveting. because i think it's perfect. especially with a cute cardi and my shoes, or with a big heel black peep toe shoes. which i also have. i want it and i want a mustard yellow cardigan to go with it. should i try to make it? it gives me hives thinking of trying...i'm so not a pattern follower...but i think i may have found a pattern. i know it's simple...but i don't know. what if i royally screw up? i guess i could always wear something else. Go for it! With a mustard cardi and your new shoes the dress will be perfect! You could so do that! Even if it's not that simple. And then when your hubby says, "I like your sleeves, they're real big," oh wait, there aren't any...when he says he likes your dress, you can say, "Thanks I made it myself!" To be honest, the first dress is my favorite, but I'm six feet tall, so that's probably why! I think you should go for it. I've recently gone back to sewing clothes for my daughter and just stocked up on some suiting for a pencil skirt and some knit for a gathered peasant skirt that I hope to make in the near future. Plus there are great tutorials and advice to be found on the web right now that make it so much easier. I found help on youtube when I couldn't remember the proper way to put in a zipper! I LOVE that dress and you should absolutely make it-then make me one! :) haha! You can do it! You can do it!! Are you kidding me? I've seen your work and you can so do this. Get started. Love the shoes. I totally think you should do it! I love that dress... in fact, what pattern is it? Maybe do a sew-along and I'll do it too! Although, from the looks of your work, you are more advanced than I am. I'd still sew it with you though! I'd say if you can find the right fabric, DO IT. It is the perfect one and would look super cute with a cardi. Love that first dress and those shoes are cute! Can we talk about where these dresses come from? I need that first one (and I am tall). Did you buy true to size? I think I want to order the red ones but don't know how the run. I LOVE the yellow ones!! Those shoes are so fun! I love your list of hang ups! Ha I totally agree. I think you should definitely try making a dress. What pattern did you pick? Maybe you could make a practice version out of cheap fabric/bedsheets until you get the fit right for the real thing? oooo, love it, you have to try and make it!!! oooh make the last one! Sooo cute! Where did you find them? Oh, I LOVE that first and last one, especially! Great dresses. Where did you find them? I'd love to see if they have patterns! holy moly i need the dress with the super-cool collar!! where did you find it? can you imagine all of the ladies that will be walking around in fancy gray dresses after this post??? WHERE DID YOU FIND THE IMAGE FOR THE FIRST DRESS? And where did you find the shoes, and to repeat another comment how do they run? true to size? wide? I'm 5'4" and rarely wear flats... that and my feet are ridiculously narrow. what a funky color combo. Love the very last dress and i think it would look great with a yellow cardi and your new shoes. Seriously V, just buy it. Just the fabric alone is going to cost you a pretty penny. And tailoring a top to fit perfectly is super hard (not saying you can't do it.). Sometimes it's worth it to just buy it new, and I'm not a shopaholic, I save tin foil! You can do it! The pattern looks pretty basic. I can't wait to see the picture with yellow cardi and shoes. It's so cute...come on over and I'll help you with it if you get stuck. Tackle the sewing project! It'll give the rest of us hope. okay links to most of the dresses are up and yes the shoes fit perfectly. kind of like glove. I have seen no indication that you are capable of screwing anything up. Everything you make is fabulous! It will be great! i LOVE the last 2 dresses. don't think you could go wrong with either one. if anyone could make a dress like that last one, it's you! not sure if you want to go through all of the itching though ;o). good luck!!! You should definitely get the first dress. They second dress is not so lovely. ooh super pretty!!! You must attempt it!!!! and i too love that color combo!!! How I wish we had a Target! I LOVE your shoes! Oh my. I have mustard yellow on my mind too for Fall. I have a couple crafts coming up that are all mustard yellow. 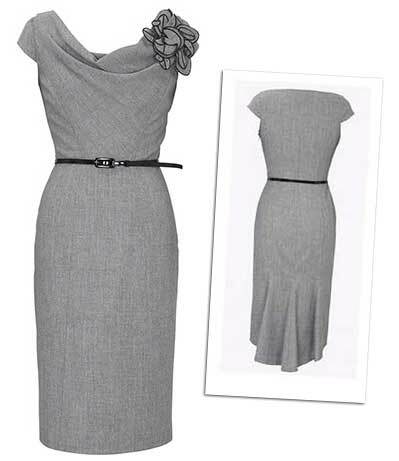 I love the last grey dress too. It would be perfect with sleeves that come just above the elbow. Would that be called a half sleeve??? I adore the second dress, do you know where it's from? And yes, I think you should buy the fourth dress; it is really pretty and classic, I think you could wear it for quite awhile, and I think it would look awesome on you (remember I have seen you in real life...so I know)! Hey I just bought yellow flats too! Not those, but still...I guess it means we are both 0h-so-stylish! PS I know have stalked those dress sites and really wish I had more money to buy some awesome clothes! Coming from another shorter person,I always thought you sounded tall. super cute shoes! i love having colorful shoes to perk up outfits! I'm 5 foot two and have the first dress. I love it! I can dress it down with a cardigan and flats and matching belt or with a long sleeved t-shirt underneath. I can dress it up with boots or heels with some funky tights. Everybody compliments me when I wear it and are impressed that it is so versatile. Go for it! Plus the flower looks cute on on a purse or hairband if you don't want to have it on the dress! 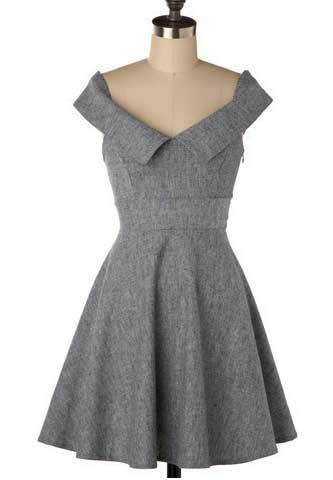 there's a super cute dress by mikarose that comes in gray. And from what I hear they now have a store in University Mall. Worth a looksie! I have this one and it's so so cute. I love the last one! We had our family pics done back in April and did yellow and grey as well!! If you found a similar pattern for the last one, please let us know what it is!! I've been looking for the Vogue 2396 Breakfast at Tiffany's pattern and can't find it! I would die for something similar! I love them all! Have you heard of the coffee date dress pattern? It's a free pattern from Burda Style (via the Selfish Seamstress), and would be SO cute in grey! looks pretty decent and goes well with that dress. Nice outfit specially those shoes i like them! Ask your Local Quilt Store to Buy the Series!